Taking an hour-long break in the middle of the working day is often fundamental for one’s productivity, allowing you to take a breather before buckling down for an afternoon of hard work. However, it seems that many British employees aren’t taking advantage of a midday break, opting to eat their lunch at their desk instead. 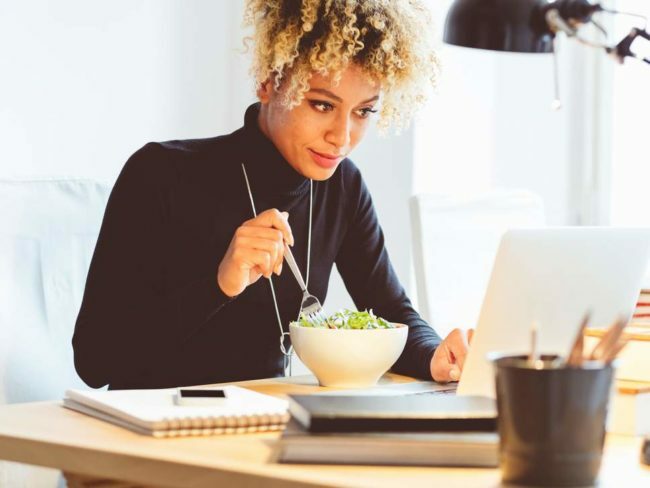 According to a new study of 1,000 British workers conducted by research company Ginger Comms, only 24 per cent of British office workers always take their lunch break. Meanwhile, 34 per cent work through their lunch every single day. The government states that employees are entitled to a 20-minute break during their working day if they work for more than six hours. Despite the fact that a large quantity of British employees are choosing not to take an hour’s lunch break, the research found that the productivity of British workers isn’t as high as one may think. The study found that the average employee only manages to get through around three hours of work every day. Five hours of the working day is spent doing activities not related to their work, including chatting with colleagues, shopping online and making batches of tea. Nonetheless, many British workers still opt to stay longer than their required working hours dictate. Almost half of those surveyed said they regularly stay at work late because their colleagues are doing the same, rather than in order to get more work done. A majority of the respondents (64 per cent) said that they believe they could be just as productive in the office during a shorter working day. In October 2018, a poll of 800 workers found that the average lunch break lasts only 22 minutes. According to the report, three quarters of people aren’t physically active during their lunch breaks. Top reasons for spending less than 25 minutes away at lunch included struggling to cope with an excessive workload and having to go through long task lists.